Here is our Q4 2018 summary report on the virtual reality startup sector. The following report includes a sector overview and recent activity. To learn more about our complete virtual reality dynamic report, visit us at www.venturescanner.com or contact us at info@venturescanner.com. We’ll highlight these takeaways with some graphics and discussions below. 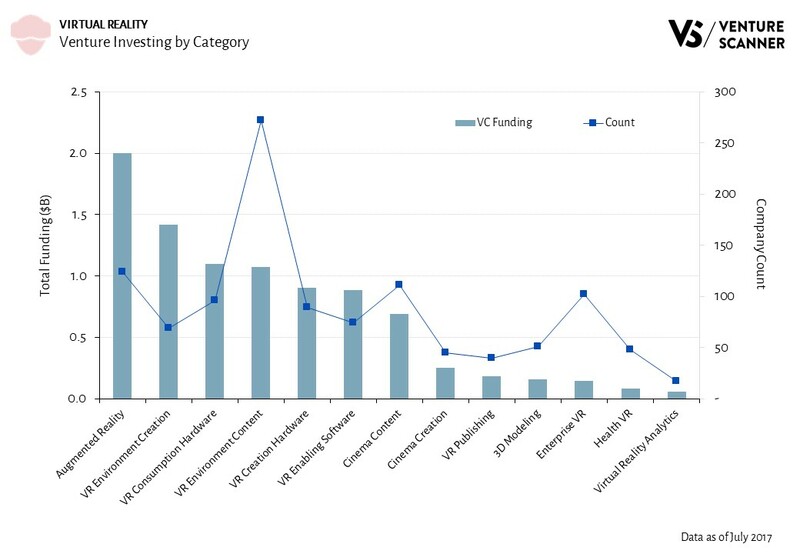 To start off, let’s review the amount of funding raised this quarter by each category within VR. 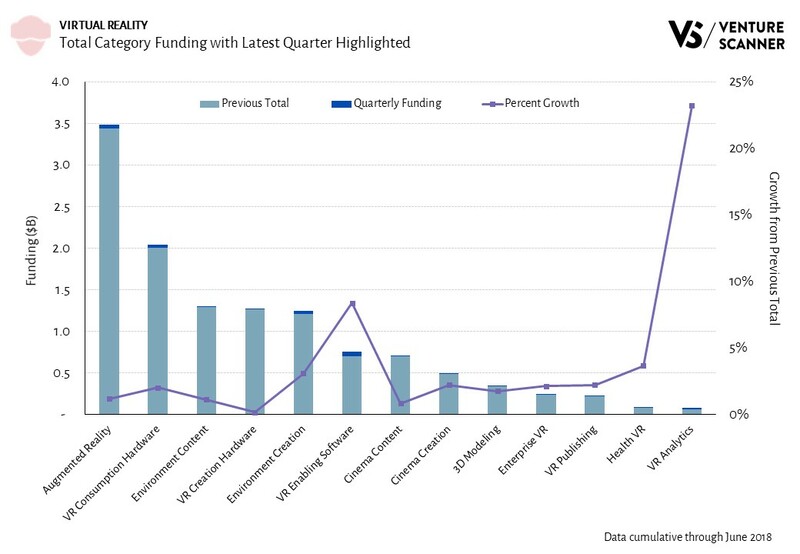 The above graphic shows that the VR Enabling Software category leads the sector in Q2 funding with $59M. Its funding is 1.4 times the funding of the next two categories, Augmented Reality and VR Consumption Hardware at $41M each. VR Enabling Software companies produce software to facilitate the development or functioning of VR products. Examples include VR media player software, video processing platforms, and VR development toolkits. Some example companies in this category include Neurable, Nomadic, Nurulize, and Visbit. Let’s now investigate how these categories’ funding compare with each other historically. 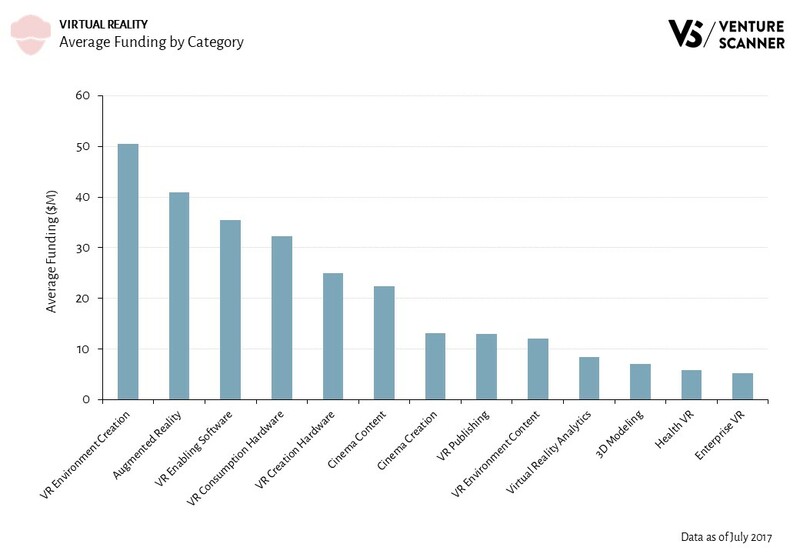 The graph below shows the all-time funding for different VR categories. The Q2 funding and growth rates of these categories are also highlighted. The bar graph indicates that the Augmented Reality category leads the sector in total funding at $3.5B. This is 1.7 times the funding of the next category, VR Consumption Hardware at $2B. Augmented Reality companies superimpose a computer-generated environment on the real world. Their products include AR headsets, AR social games, and AR surgery simulations. 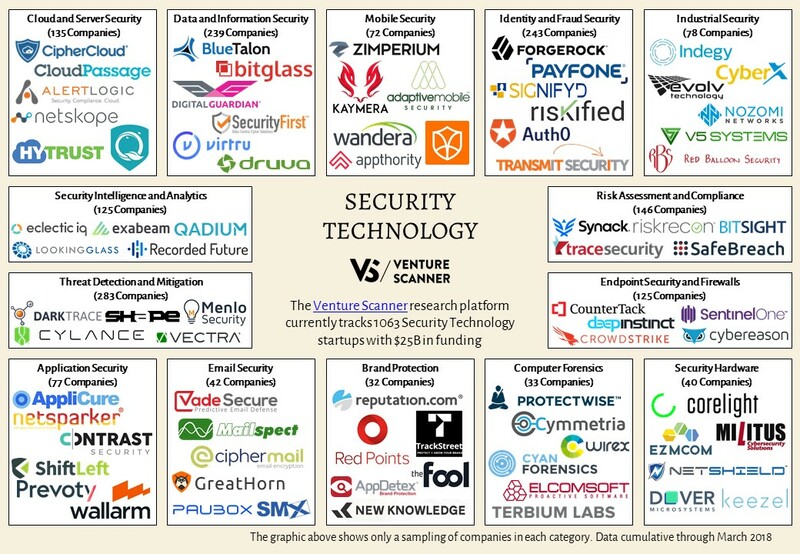 Some example companies in this category are Lumus, WayRay, Meta, and Blue Vision Labs. The VR Enabling Software category leads virtual reality in Q2 funding. In addition, the Augmented Reality category leads the sector in all-time funding. 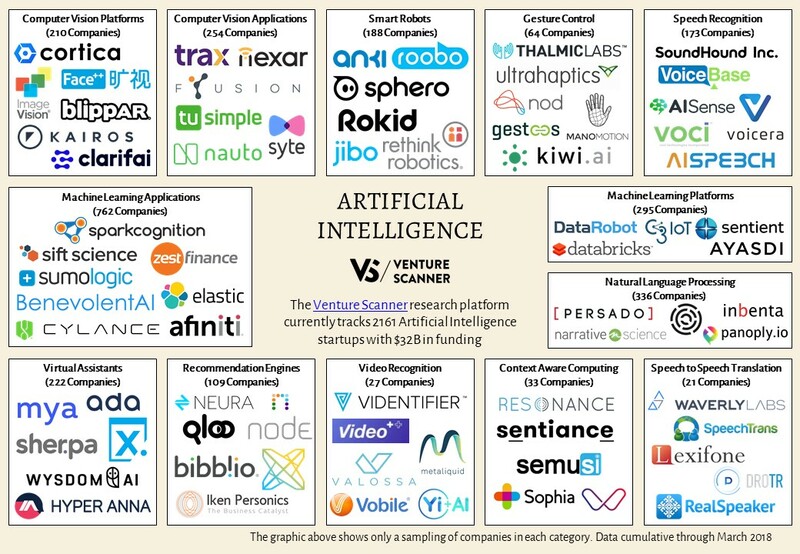 To learn more about our complete virtual reality report and research platform, visit us at www.venturescanner.com or contact us at info@venturescanner.com. Here is our Q2 2018 summary report on the virtual reality startup sector. The following report includes a sector overview and recent activity. To learn more about our complete virtual reality report and research platform, visit us at www.venturescanner.com or contact info@venturescanner.com. The virtual reality (VR) sector has seen a lot of buzz in the news lately. Its applications can be observed in all industries from health to entertainment to real estate. In addition, we’ve analyzed that its funding and exit momentum has experienced significant growth in recent years. We will now take a closer look at the different components of the VR sector and how they make up this startup ecosystem. We have classified the companies into 13 categories. This blog post will illustrate what these categories are and which categories have the most companies. We will also compare the categories with one another in terms of their funding and maturity. Let’s start off by looking at the Sector Map for the VR sector. We have classified 750 virtual reality startups into 13 categories that have raised $10 billion. 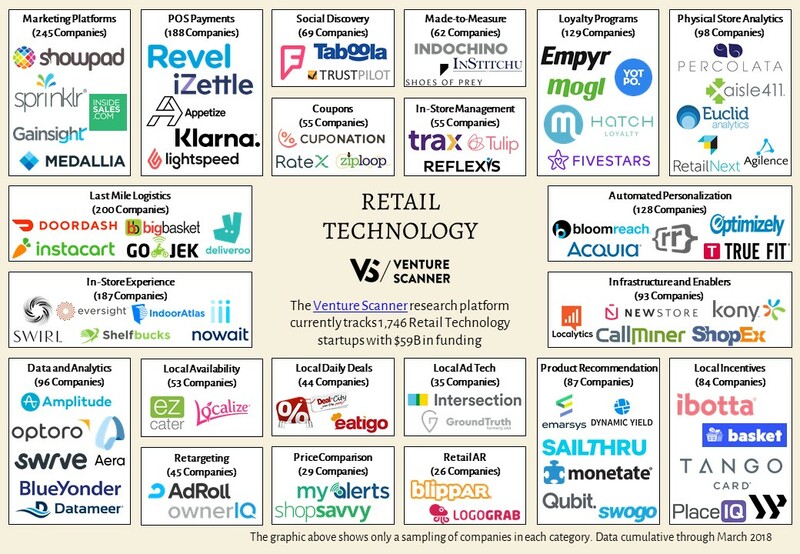 The Sector Map highlights the number of companies in each category. 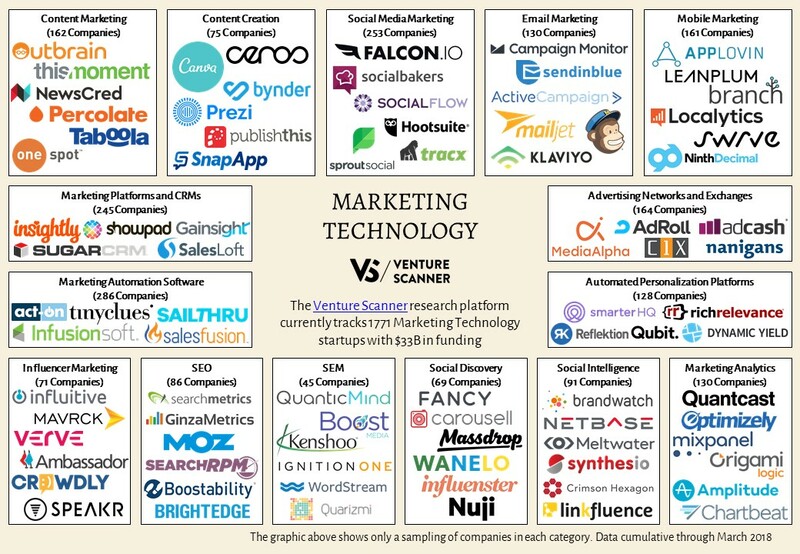 It also shows a random sampling of companies in each category. We see that Virtual Environment Content is the largest category with 286 companies. These companies create or present computer-generated spatial simulations for the user to experience. Such environments include virtual reality video games, learning platforms, and socializing platforms. Some example companies are VRstudios, Survios, VREAL, and Reality Reflection. We have seen what the different categories making up this sector are and the number of companies in each. What about their funding and maturity in relation to one another? Let’s look at our Innovation Quadrant to find out. Our Innovation Quadrant divides the VR categories into four different quadrants. 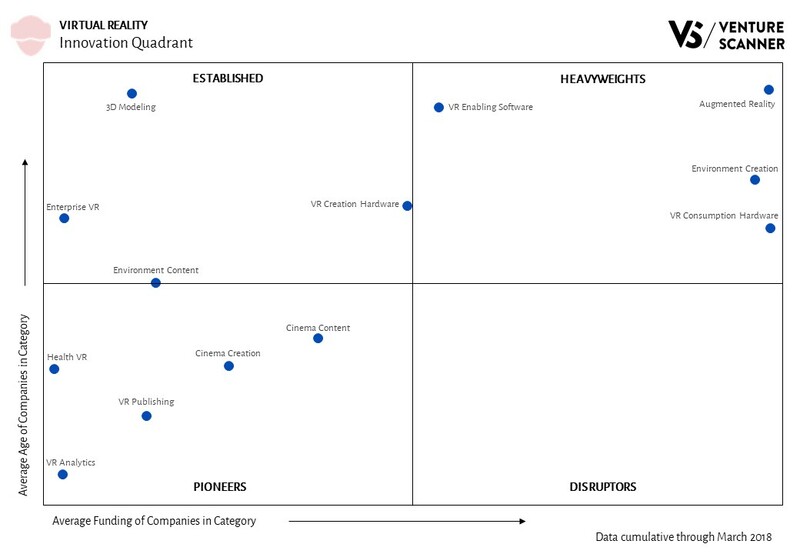 We see that the Pioneers quadrant has the most virtual reality categories with 5. The Pioneer categories are in the earlier stages of funding and maturity. The Established quadrant has four categories that have reached maturity with less financing. The Heavyweights quadrant also contains four categories. These categories have reached maturity with significant financing. We’ve analyzed the virtual reality categories and their relative stages of innovation. Let’s now look at how they stack up against one another in terms of their total funding versus company counts. As the above graphic implies, the Augmented Reality category leads in funding with $3.5 billion. Its funding is almost 171% of the funding of the next category, Virtual Reality Consumption Hardware. Most notably, about 74% of Augmented Reality funding ($2.6 billion) comes from two companies: Magic Leap and Niantic. Augmented Reality companies create products that superimpose a computer-generated environment on a user’s view of the real world. Their products include augmented reality headsets, augmented reality social games, and augmented reality surgery simulations. Some example companies in this category are Lumus, WayRay, Meta, and Blue Vision Labs. The analysis above highlights that the Virtual Environment Content category leads the sector in total companies, and the Augmented Reality category leads in total funding. It’ll be interesting to see how the virtual reality landscape will change and develop throughout the rest of 2018. Here is our Q1 2018 summary report on the virtual reality startup sector. The following report includes an overview, recent activity, and a category deep dive. 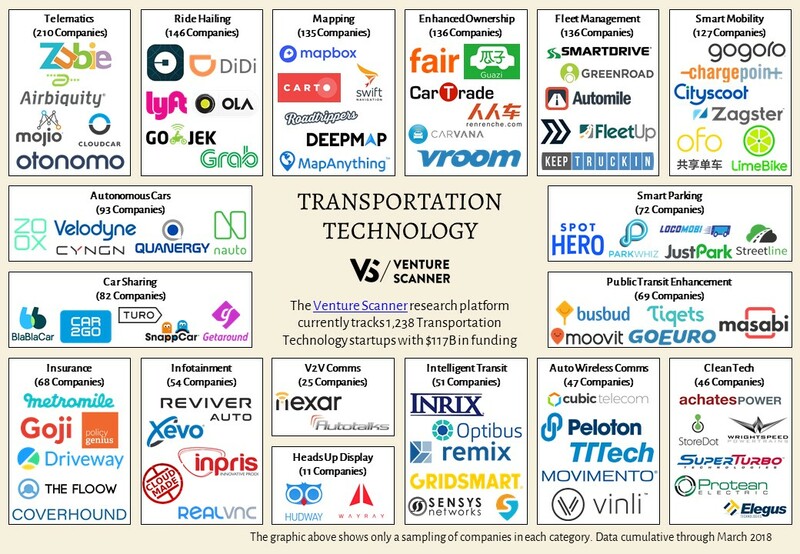 Our sector maps are snapshots of emerging technology sectors. They show what the different categories in a sector are and how many startups are within each category. 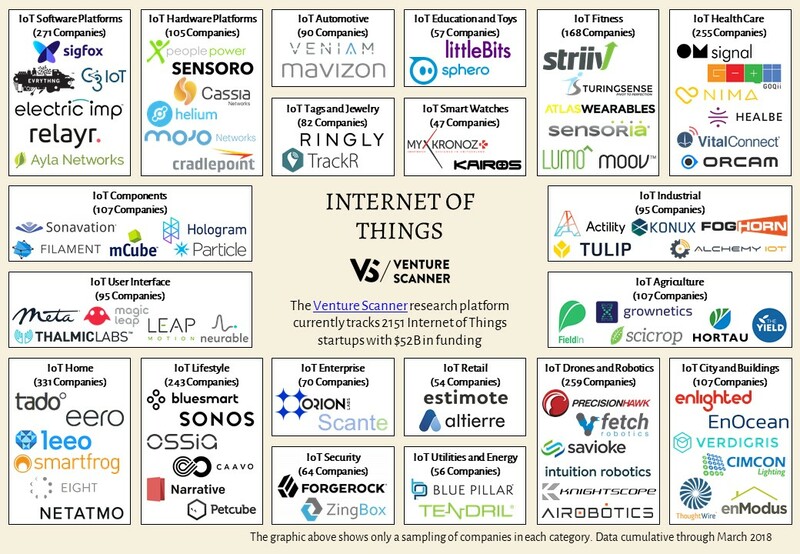 They also present a small sampling of the current startups that are innovating in each category. Last week, we kicked off our sector map update with Part 1. You can read that blog post here. This post is the second of a two-part series. 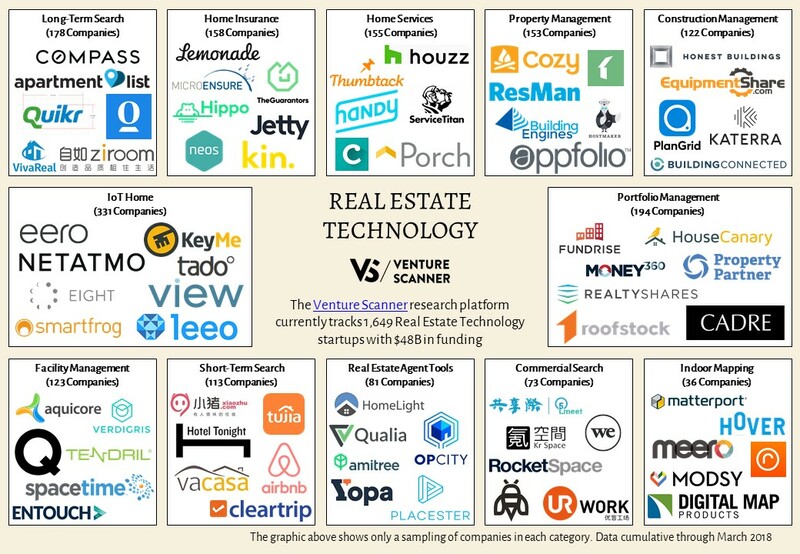 Below you will find sector maps for Artificial Intelligence, Internet of Things, Marketing Technology, Real Estate Technology, Retail Technology, Security Technology, Transportation Technology, and Virtual Reality. To learn more about our complete report and research platform, visit us at www.venturescanner.com or contact us at info@venturescanner.com. The following graphs highlight venture investing trends into the Virtual Reality (VR) sector. The graphics include data through July 2017. 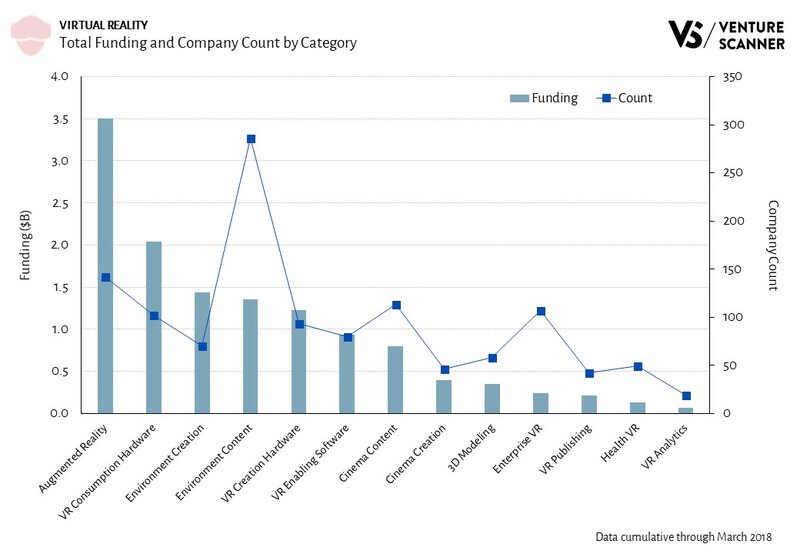 The above graph compares the total venture funding in each VR category to the number of companies in the category. The Augmented Reality category leads in funding at around $2B. The VR Environment Content category leads in the number of startups with about 272. 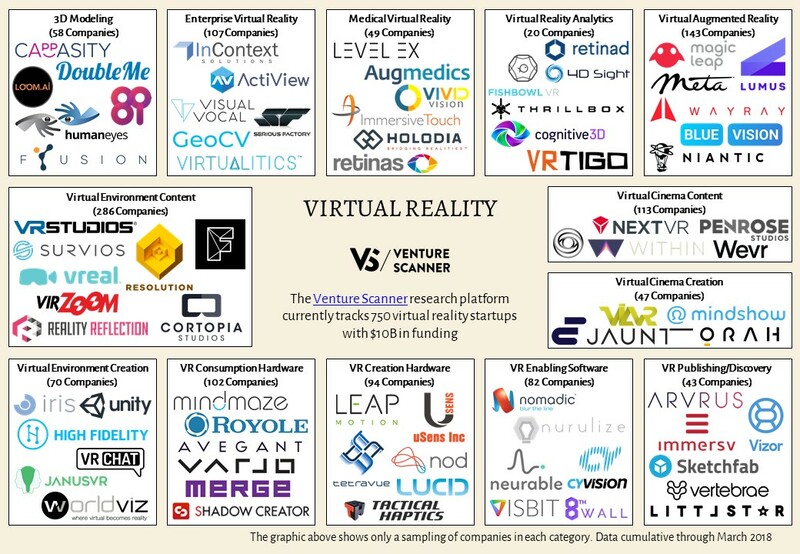 The above analysis summarizes the average company funding in each VR category. 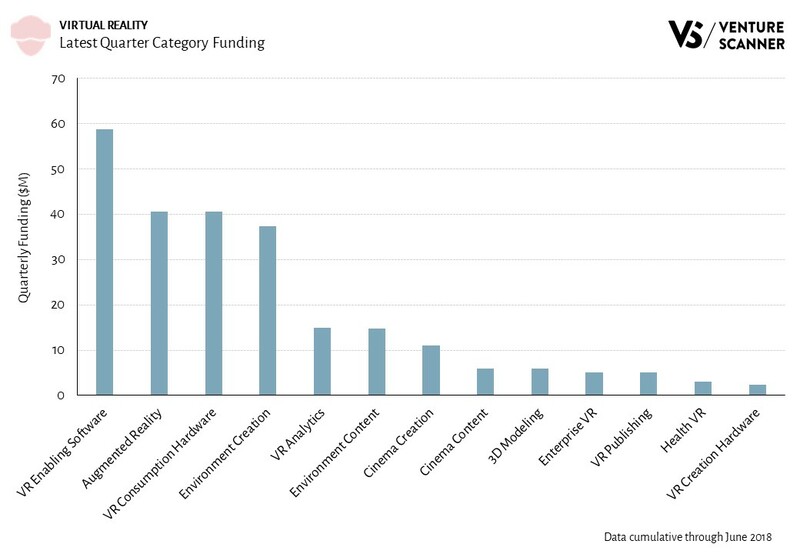 The VR Environment Creation category leads the sector with around $51M in average funding per company, followed by the Augmented Reality category with around $41M in average funding per company. We are currently tracking 718 VR companies in 13 categories across 49 countries, with a total of $8.1B in funding. Click here to learn more about the full Virtual Reality market report.